Professor Lorenz Eitner has kindly confirmed the attribution in a letter dated 6 April 2000. He dates the sheet to 1814-15, when Géricault used this distinctive technique, and compares it to a double-sided drawing of The Execution of Général de la Bédoyère in a private collection (G. Bazin, Théodore Géricault, Paris, 1992, V, p. 203, nos. 1629-30) and a double-sided sheet of Three fashionably dressed women (G. Bazin, op. cit., III, p. 166, nos. 775-6). Both these drawings come from a dismembered sketchbook which may also be the source of the present drawing. 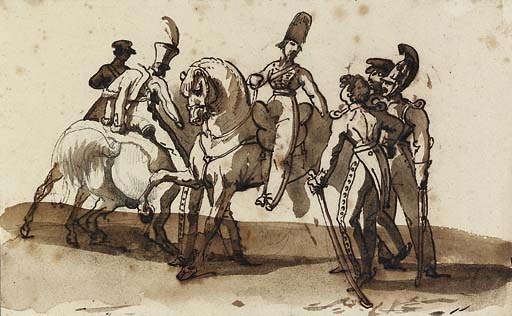 The studies of a cavalry skirmish on the verso of the present lot closely correspond with a sheet from the Chicago album referenced in the previous lot, which is also datable to 1814-15. A double-sided sheet, of similar technique and subject, was sold in Paris, Collection Gobin, Piasa, 31 March 2000, lot 115. It has been suggested that the subject may refer to the Allied invasion of France in 1814, and notes that some of the officers wear Russian uniforms.